On Friday afternoon, the view of Edgewater Village from Hill Street and the tracks along Water Avenue. Along the Albany riverfront — my beat, if you’ll remember — home construction has entered another phase at Edgewater Village, and a long-planned apartment complex is still in the works farther east, near Bowman Park. 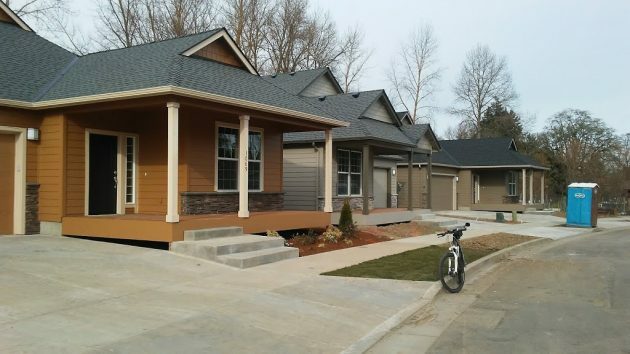 At Edgewater Village, Baldwin Construction of Albany has just finished four new houses overlooking the Dave Clark Path and the Willamette River, bringing the total to six in that row. 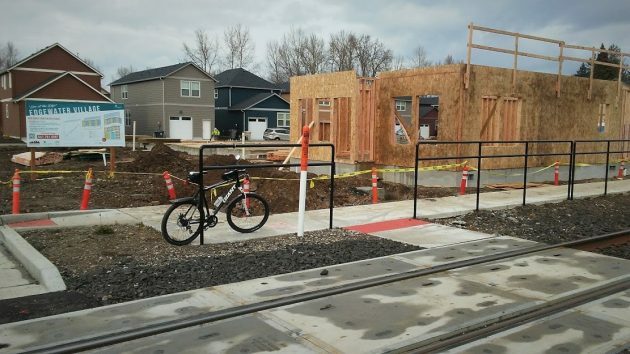 This week, the contractor began work on the foundations for townhomes backing up to the Water Avenue railroad track west of Madison Street. Some 28 townhomes will be built in that section of the development, 12 along the track, 10 overlooking the river, and six in the middle. And east of Hill Street, the walls have started going up on the first of five houses. All of that is in keeping with plans announced in April 2018. That’s when the Albany Revitalization Agency (or CARA) changed the terms of previous agreements to allow developers George and Paula Diamond to secure nearly $10 million in private bank financing in order to finish the project by the end of 2020. Meanwhile downstream, east of Geary Street and Bowman Park, on another former industrial site, Willamette River Holdings LLC of Salem has been putting together plans for a riverside apartment complex. According to the site plan, the complex is to be called The Banks. One of the principals, Patrick Morley, told me the number of planned units had been scaled back to 96 apartments and nine townhouses in response to neighborhood concerns, and the buildings would have three stories instead of four. Three of the four newly completed riverfront houses at Edgewater Village on March 14. The Monteith District should be allowed to become fresh with homes like this. Older homes are great, I live in a 1911 home. Yet, they are a money pit. Unless they were made of brick, they should be allowed replacement to revitalize the downtown Albany area. Monteiths? They lived in Albany a short time and moved back to New York. Get over the regulations. This Albanian stands with Bill. A certain segment of this community has outsized influence on these matters. Nothing would prove Albany more imaginative and forward-leaning than for the entire Monteith district to become a proving grounds, allowing for the full expression of imaginative architecture. Looking back freezes a community in a fantasized falsehood. Why should Albany need to prove to be forward-leaning and progressive? Nothing beats the architecture of the historic homes. As long as you have money to pour into them. We are talking about a changing economy. Money cannot keep this neighborhood golden forever, with old delapidated historic homes. I simply said the neighborhood could be revitalized as so many inner city homes fall into economic disrepair and despair.